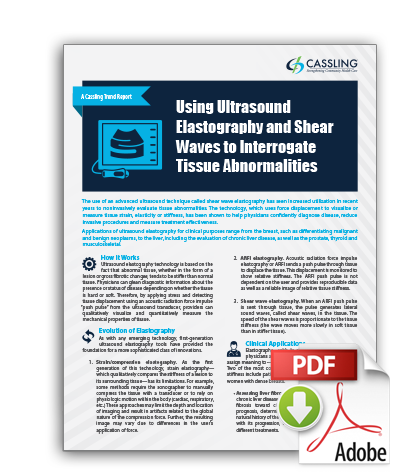 The use of an advanced ultrasound technique called shear wave elastography has seen increased utilization in recent years to noninvasively evaluate tissue abnormalities. The technology, which uses force displacement to visualize or measure tissue strain, elasticity or stiffness, has been shown to help physicians confidently diagnose disease, reduce invasive procedures and measure treatment effectiveness. Applications of ultrasound elastography for clinical purposes range from the breast, such as differentiating malignant and benign neoplasms, to the liver, including the evaluation of chronic liver disease, as well as the prostate, thyroid and musculoskeletal.